Before investing your hard earned money on a sewing machine, you’d better do a vast research on the best there are. Sewing machines are known to break down so easily, so you made end spending more bucks in repairing and maintenance than the initial cost. When buying a sewing machine, go for the highest quality within your budget. Secondly, you need to consider the availability of spare parts in case the machine broke down. On this note, it’s recommendable to go for a brand that has been there and that which seems to have a future. Moreover, the brand should assure you of a few years’ warranty and continued support. Thirdly, consider whether the machine supports the functions you need it for. Do you need the machine for stitching, embroidery or other purposes? While certain devices support only a single function, there are others which can carry out several tasks. Besides, a machine with several accessories with it is more recommendable. Lastly and most importantly, consider other people’s reviews on specific sewing machines. From previous buyers’ experiences, you’ll be able to make a more informed decision. You’re also less likely to fall for a machine that’ll frustrate you. Below, find a list of the highly rated and most reviewed machines for this year. 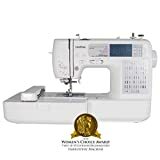 If you are a beginner in the hunt for an ideal versatile sewing machine that you can easily carry to your class, your search ends here. Janome is lightweight and much easier to use. In fact, only a few are in stock, thanks to its reliability and great quality. Janome 2212 comes with 12 built in stitches for you to maneuver around several projects. It uses a vertical bobbin, not the horizontal one. This makes it much easier to deal with thread jams. Additionally, it comes with an easy to understand manual book that walks you through its functionalities headache-free. From one of the most trustworthy brands we’ve had for decades, there’s no doubt you’ll love this baby. Brother Project CS5055PRW is an electrical, hi-tech and fully computerized machine that offers you 50 outstanding stitches to add to your fun. 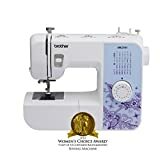 With a vertical spool pin, an automatic threader and the numerous accessories in the package, this is an incredible choice for both the sewing pros and the newbies alike. From the LCD display, you can quickly select your preferred stitch in seconds. It’s then backed by a generous 25-years warranty, so order with confidence. If you’re after a durable workhorse that’s a four-wheel-drive on almost any type of fabric, I would recommend this Singer 4432. It has smooth and precise stitches. You’ll find it an irresistible sew mate especially if you need it for commercial purposes. It’s not a plastic thing. This features an all round metal frame to withstand long continuous sewing hours on any fabric. With over 1100 stitches in a single minute and an incredible feeding system, you’ll be done with your projects as sooner as you start. Amongst its unique features are its clear bobbin view, a whole collection of accessories and its smartphone downloadable assistance App. Other reviewers loved its labeled controls which make it extremely easy to use. What will you like about this machine? Firstly, you’ll be awed by its 23 pre-programmed stitches adjustable at the twist of a dial. These will help you give some custom designed professional stitches to your work in seconds. Secondly, it’s not complicated making it a perfect choice for the beginners. Also, its automatic needle threader comes in handy for you whose eyes are defying orders of late. Its stainless steel bedplate again allows the fabric to slide flawlessly. Notably, you’ll also like its reverse stitching ability that allows you to strengthen your stitches when need be. SINGER sewing machines are known for their excellent performance. This particular model boasts a computerized performance which makes it safe for the user and more effective than most of its competitors. It offers an array of stitch options which let you fulfil each task as expected without hitches. Also, the sewing machine boasts an easy-to-use design which makes it ideal for learners. Furthermore, there’re various customization features which let you choose the fonts and other aspects. With over 23 built-in stitches and 12 decorative stitches, this is one of the best sewing machines on the market. It allows you to undertake a plethora of sewing projects effortlessly. And, the automatic needle threader lets you thread according to any specified print provided the machine has been programmed accordingly. It also has built-in features which help one get the threads into the needle eye without failure which cause frustration. The high speed operation makes the sewing machine ideal for huge projects which require high speeds. Brother sewing machine is a tough and versatile masterpiece which is designed to ensure that you get the best sewing results. The versatile design makes it ideal for various sewing projects. It comes with several built-in stitches with six sewing feet and a free arm for added convenience. This sewing machine also allows one to stitch in a zigzag, decorative or blind hem design. With 27 built-in stitches, you can’t go wrong with this sewing machine. For beginners who need a sewing machine that’s just under their budget, Michley LSS-505 is a good start. This one has only 8 built in stitches but also has several features enjoyed by the highly priced machines. These include adjustable sewing speeds and a top loading bobbin under a clear view cover for easy monitoring. Either for quilting or hemming pants, you’ll find Michley easy to use and fast to understand, thanks to its clearly labeled controls. It has a sturdy handle that makes it truly portable and a stable base. The only con you’ll find is its inability to control the stitch lengths. This Brother SE400 is similar to the previous model, Brother SE1800 but has some differences. To begin with, it’s way cheaper than SE1800. Also, this SE400 has 67 built in stitches. Its automatic threader, thread cutter, and sideways stitching features all work together to offer you impressive customized creations hassle free. From its LCD display, you can easily select the embroidery or stitch that you want. Again, just like its brother SE1800 you can import new designs through the USB port it comes with. Brother SE also features a stress-free bobbin winding system that prevents jamming. You’ll also like its operation manual that comes in both English and Spanish versions and a ton of accessories that include almost everything that you require. Would you like to skyrocket your sewing prowess to professional results in a matter of days? Then you need this package. 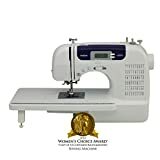 Besides the award-winning sewing machine, you also get a detailed step by step instructional book and a DVD with crystal clear videos to guide you on various techniques. 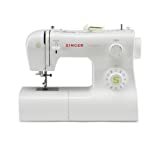 With its 100 pre-programmed stitches and 10 presser feet, Singer 7258 will keep you imaginative and incredibly creative in fashion sewing, quilting, and hemming. You’ll also be able to control your stitch length and width in a dial of a button. 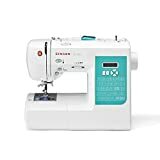 This budget friendly sewing machine features an easy to use pattern selection knob from which you can choose one of the 25 stitch patterns it offers. Its free arm allows you to design your cuff sleeves and hems as you desire. Also, forget the tweezers and scissors. Its needle threader and cutter feature have your back. Notably, this machine is small and compact size thus requiring less space. It also comes fully packaged with all the accessories you need to get you sewing 5 minutes after its arrival. This is for you who have been searching for a fully computerized, silent, user-friendly, and a push button sewing machine. Brother CS6000i has almost all the components found in ridiculously priced sewers but in an understandable easy to use budget friendly model. A part of its arm provides housing for your accessories so you’ll not be hassling in your classes. Moreover, this model gives you full control of your sewing speed. A sewing machine is necessary for carrying out some basic sewing and embroidery tasks at home. It’s a must have if you want to avoid cheap clothes. With it, you can custom design your outfits whenever you feel like. As such, we know that having the best machine is inevitable. We firmly believe that you’ll get an ideal sewer from the list above. I recommend you to #1. Brother CS6000i Price and quality are affordable and best seller in Amazon. This is amongst the most versatile and most computerized sewing machines we have on the market today. It boasts several features that keep it a level above other contenders. 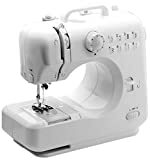 Besides its built-in 184 sewing stitch collection and 136 embroidery designs, you have the freedom to add more and more of these through a USB port. Brother SE1800 features a top loaded drop in bobbin that makes it easy to access. Its controllable speed of stitching is another feature not common with other machines. You’ll also benefit from an array of sewing feet that are easily interchangeable.